SWPN | We are a collective partnership of agencies and individuals who work together to improve the quality of life in the Southbridge neighborhood of Wilmington, Delaware. We are a collective partnership of agencies and individuals who work together to improve the quality of life in the Southbridge neighborhood of Wilmington, Delaware. Formed in 2009, the South Wilmington Planning Network (SWPN) is a collaborative partnership of residents and dozens of government, non-profit, and private agencies who work together to improve quality of life in the Southbridge neighborhood of Wilmington, Delaware. Southbridge is an historic, African-American, working-class neighborhood of 1,300. The community struggles with environmental and health concerns, high unemployment and a poverty rate of 30% – nearly three times the state average. Rain barrels help to elevate flooding in the area, control mosquito populations, and are cheap and easy to make. More MLK Day of Service INFO here! 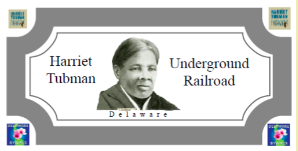 The Harriet Tubman Underground Railroad Byway runs through Southbridge. “Byway Bucks” are coupons that offer discounts at participating stores along the route. Get your byway bucks here!